Objectives. The aim of the present paper was to analyze the impact of Romanian public campaigns about the incidence of hepatitis B and C.
Material and methods. The analysis used the triangulation of three methods of research: the content analysis of the Romanian NGO’s websites about preventing and fighting against hepatitis, an online survey carried on 155 respondents and a set of interviews made with eight executives (NGO’s and public institutions ‘representatives) who are involved in such public campaigns and, at the same time, are also infected with hepatitis B and C.
Results. The findings can be summarized as follows: 1) 46% of the Romanian respondents to the online survey did not know anything about a public campaign on hepatitis, and one quarter of them did not intend to know more in the future. 2) The NGO’s websites on fighting against and raising awareness about hepatitis B and C in Romania were full of medical languages and neologisms and, as such, they addressed only to a targeted public. 3) The set of interviews made with hepatitis infected respondents showed that in case that someone gets ill he or she understood the importance of public campaigns about health and became involved in this type of social action. Conclusions. The basic conclusion of the study is that the success of public health campaigns in Romania depends in a high degree on a network of factors (funds for financing it, involvement of state’s institutions and media and public awareness of the topic among Romanians). Keywords: health communication; public campaigns; hepatitis; public awareness of health and illness. Relevant communication in health is a constant topic of analysis and debate within academic research community over recent decades. It is widely acknowledged that the free access to information allows people to be more efficiently informed about health issues. As Schiavo showed (2007, p. XII), the fact that people know about a certain disease and what can be done related to its prevention result in an improvement of the entire medical system and contributes to the internal balance of its elements. According to Schiavo (2007, p. XIII) there is a general consensus that health communication is based on various fields such as mass communication, social marketing, anthropology and sociology, and this eclectic character is, in fact, its strength. Some anthropologists, specialized in the sociology of health and illness, have shown that patients with chronic conditions require special care of their disease (Adam and Herzlich, 1994). At the same time, the sociologists have emphasized the important role of social and cultural representations of health and disease for the individual and collective behavior when individuals faced chronic and emerging diseases. Thus, according to Canguilhem (1988) the individual behavior of a person in society varies according to what he thinks of his health. Health then expresses a certain relation of the human being to his experience, a report that goes well beyond the remit of the care system (Canguilhem, 1988) and social inequalities translate into inequalities in health and disease. Romania occupies one of the first positions in the European ranking due to high rates of hepatitis infection among population (World Health Organisation, 2015). Nevertheless, the Romanian state’s initiatives for preventing and fighting against this disease were and remain scarce, almost invisible, and very little is done to inform the population and prevent the disease. Due to the fact that almost 20% of the Romanians are under the risk of contracting hepatitis it is obvious that the prevention measures are more stringent than in the case of other diseases (***Populaţia României ACUM, 2013). A key-element for preventing and fighting against the spread of a disease is the planning and implementation of health communication campaigns, and this is also the case with hepatitis. As Schiavo (2007, pp.57-69) and MacStravic (1986, pp.1-15) showed, any health-related communication campaign has to overcome some obstacles, among which the most important are: health-related inequalities (at social level and that of the medical system); patients’ empowerment in order to change and improve his or her style of living; the limits of health prevention; the development of e-health through the Internet; high levels of health illiteracy; emergence of old diseases (such as cholera or tuberculosis); lack of medical infrastructure. At a theoretical level, one can speak about three types of health communication campaigns: information campaigns (e.g. prevention campaigns and campaigns related to treatment of diseases); campaigns that aim to change the life-style and campaigns intended to strengthen and promote healthy behaviour. At first glance, it seems that the vast majority of Romanian health campaigns could be circumscribed to the first type of campaign, they are mainly information campaigns related to health and diseases, and only a small proportion of them could be enclosed in the second type (the campaigns that aim to change the health-related behaviour of people). The present article will try to analyze the ways in which communication about health issues took place in Romania in the last years, on a specific case: the public campaigns of awareness about the incidence of hepatitis B and C discussing the specific case of public campaigns aiming to raise awareness about hepatitis B and C incidence. My analysis is focused on some communication campaigns regarding hepatitis, which were promoted in Romania in the last years. The main assumption of the study was that any health-related communication campaign should have an important influence on people’s behaviour related to health and illness. Health-related advertising in Romania is only informative and does not refer to disease prevention. Health-related communication campaigns in Romania target only patients and not healthy people (who are at risk). From a methodological point of view, the analysis is based on the triangulation of three methods of research: a content analysis of the Romanian websites about preventing and fighting against hepatitis, a survey of the opinions, attitudes and information about health-related behaviour and a set of interviews with eight experts in the field of hepatitis. People’s interest in obtaining information about hepatitis as disease will increase if they are somehow exposed to a campaign centred on health and illness. The exposure to media content related to hepatitis as disease can result in a possible tendency of people to change their health-related behaviours. The Romanian websites about hepatitis disseminate only information about the disease, and not messages about prevention of the disease. The Romanian websites about hepatitis disseminate information using medical terminology, which make them less accessible to the general public. 1. The Romanian experts on hepatitis assess that health-related campaigns are important for the prevention of this disease. 2. The Romanian experts on hepatitis assessed that more information about the treatment and prevention of hepatitis should be available to the general public. The triangulation of methods was, also, repeated at the level of the analysed samples, and three different samples are used in the study. The content analysis was made on five websites that approached the general themes of “hepatitis” as disease: www.afladec.net; www.tustiidece.wordpress.com; www.hepato.ro; www.abch.ro; www.hep.ro. The analysed websites are owned either by medical organisations or by NGOs representing patients with hepatitis. The second sample analysed had a volume of 155 survey respondents, aged 18-40 years, who graduated high-school or University and who lived in Bucharest. The third sample was represented by eight individuals who were executives (NGOs’ and public institutions’ representatives) involved in such public communication campaigns and infected, at the same time, with hepatitis B and C. The rationale for the third sample was based on the assumption that they not only have an in-depth knowledge of the issue, but also possess a better understanding of the disease and its prevention. The period of time in which all data were collected was February-July 2014. When asked about the main problems affecting the health system in Romania, only 6% of the respondents assessed that lack of information is an important problem, while lack of funds (20%), lack of hygiene (18%) and bribe (17%) were assessed as the main issues of the Romanian medical system. Table 1. In your opinion, what are the main two issues the Romanian medical system faces at present? Due to small salaries and lack of funds, when you go to the hospital you have to give bribes in order to have access to some medical services. There is a lack of hygiene in the hospitals as a result of the bad management of funds, of wrong expenses and of organised thefts. I think that lack of funds is the main problem at stake here. From that results the lack of funds for salaries and for hygiene. If someone goes to a private hospital, he or she can overcome these problems, but the vast majority of population is going to public hospitals where these problems are paramount. The lack of professionalism of medical staff leads not only to the impersonal ways in which doctors and nurses treat patients, but also, and mainly to their demands of extra-payments for treatments. Although they are complaining about bad treatment in hospitals and clinics, the citizens take no measures against that. So it is their fault that they do not take actions against that situation by organizing protests or other forms of public disobediences. Table 2. In general, what do you know about hepatitis? As the results showed in the above table, only 11% of the total sample of respondents does not know anything about hepatitis as a disease. Given that 89% of the respondents claimed that hepatitis “can be treated”, “it is contagious” and “it is a deadly disease”, one could conclude that, related to hepatitis as a disease, people do not know very much and more specific information is needed. At the same time, 43% of the respondents had declared that their knowledge about hepatitis is low or/and that they have no knowledge at all about this disease. As the survey showed, although 56% of the respondents declared that they knew relatively enough about hepatitis, only 17% of them discussed about this topic or/and underwent the tests. From the total number of persons who declared that they were aware of the health-related risks associated with hepatitis, only 6% had previously asked to be checked for it. Table 3. How do you assess the health-related communication campaigns in Romania? A great percentage of respondents (36%) supported a pro-active attitude toward hepatitis B and C, since they agreed that the existing health-related campaigns could be improved. On the second place, the respondents placed the lack of efficiency of those communication campaigns and their lack of attractiveness. Table 4. Which are the communication campaigns related to hepatitis that you remember? Although the “Află de C” (“Find about C”) campaign had been organised in public spaces within different location in Bucharest (metro stations, out-door advertising etc. ), only 15% of respondents mentioned it. 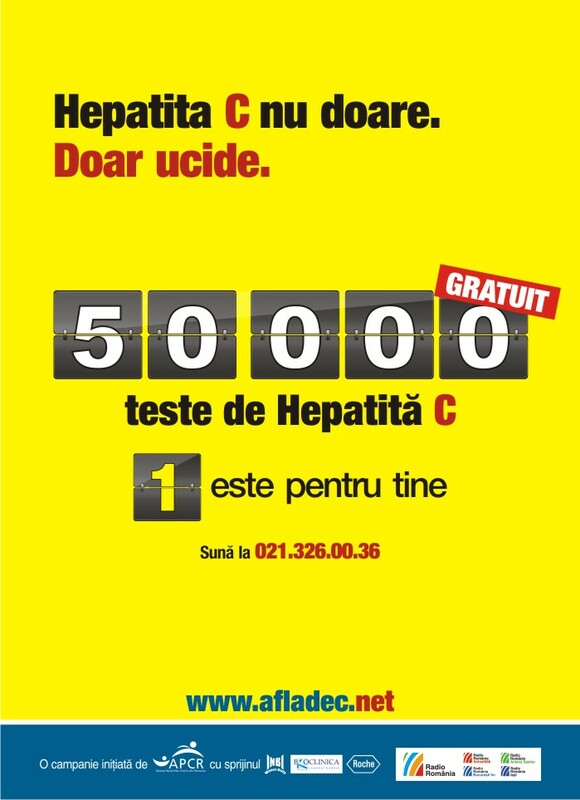 The same percentage of respondents remembered (and, as such, noticed) the campaign of free testing for hepatitis ”Afla de C” (“Find about C”), while the Accept Foundation’s campaign “Testeaza-te pentru Hepatita C” (“Test yourselves for hepatitis C”) was mentioned in the third place. As the results showed, 54% of the respondents could identify one or more of the existing communication campaigns related to hepatitis, while 46% of the sample knew nothing about these campaigns. Table 5. If you noticed a communication campaign related to hepatitis, what did you do after you saw it? Only 11% of respondents who noticed the campaign (54% of the total sample) had declared that they discussed on this topic with others, while only 6% (from the same 54%) underwent a test to see if they were infected with hepatitis B or C.
A high percentage of respondents – 85% of the analysed sample – declared that it was the first time when they saw the campaigns and posters for hepatitis shown to them. 17% of them declared that they “probably saw” the poster, while only 1% of the sample declared that they knew the poster and the campaign(s). This means that around 20% of the total sample of respondents were not even once exposed to these campaigns and knew nothing about them. When asked what they would do after they saw the images and posters, around 40% of the respondents mentioned that “they remembered some ideas from the poster” and 25% that they were interested in the topic and would perhaps search on the internet in the future to find more information. At the same time, 14% of the respondents had declared that they would do nothing in the future related to this topic. When asked what other sources of information they will access after exposure to both images, 44% of the respondents who saw the image for “Tu stii de C” campaign and 48% of the respondents who saw the image for “Afla de C” (“Find about C”) campaign declared that they would search for more information on the Internet. Table 6. What other sources of information would you access after seeing the image for “Tu stii de C?” (“Do you know about C?”) campaign? Table 7. What other sources of information would you access after seeing the image for “Afla de C?” (“Find about C”) campaign? Given that the Internet has been nominated as the main source for future and possible hepatitis-related information by 44% and, respectively, 48% of the analysed sample, I tried to see what kind of information are available on the Romanian websites related to this disease. The content analysis of the websites revealed that 29% of the published articles directly approached the social aspects of hepatitis as disease, 15% of the articles covered the ways in which people get infected with this disease and only 1.5% clarified the way in which hepatitis is not transmitted through certain channels and ways. From the total number of articles published on those websites, 51% were focused on the topic of treatment and 54% reported cases of disease remission. As regards the vocabulary, 88% of the articles contained medical terms and 89% of them contained neologisms. According to the general data, 68% of the articles published on the analysed websites referred to one type of hepatitis and 24% contained foreign terms (mostly English words). Only 32% of the articles had links to other websites – 13% to generalist websites and around 9% to Governamental websites and Romanian NGOs websites. At first glance, one can notice the fact that state’s institutions were rarely mentioned in the articles published on the analysed websites – 1.8% of the total sample mentioned them in connection to the donation of 2% of the personal annual taxes to institutions and NGOs according to Romanian legislation. My analysis showed the fact that a great percentage of the total number of articles published by these websites used a technical vocabulary – 88% of them used medical terms, which are not accessible to the general public. Around a half of the articles (51%) covered the topic of treatments and only 15% provided information on hepatitis symptoms. The social aspects involved in this disease are covered only by 30% of the articles and there are two websites (hep.ro and afldec.net) that did not cover those aspects. According to the analysis, more than a half of the articles were accompanied by photos and images, and only 18% of them made references to the campaigns of information about hepatitis. The majority of images published on those websites referred to the events and activities organised by the NGOs that owned the websites and make little or no reference to any general campaign of information about the disease. The use of term “hepatitis” was widespread and only 8.8% of the articles did not use this term (all articles used this term in the case of the “hepato.ro” website). Only 10% of the total analysed sample referred to the healthy life-style and a similar percentage (10%) indicated the dietary requirements for patients infected with the virus. Those data could lead someone to the conclusion that the main target audience for the analysed websites was made of people that are already infected with hepatitis. The websites seemed not to consider the healthy people at risk of infection in Romania, whose percentage is rather high. This assumption is enforced by the high percentage of articles that covered the issue of disease remission: 54%. As could be noticed, there were few – around 15% – articles that presented the ways in which people could contact hepatitis and only 1.5% of the analysed articles offered also information on the ways in which this disease could not be transmitted (two websites did not published any information on this aspect). In addition, the websites rarely advertised other channels for disseminating the information requested, such as Facebook pages or Discussion forums, even if they used SNS and alternative channels of communication. The higher incidence of personal pronouns for the singular first person (“I”) within the articles published by these websites showed the personal tone in which they addressed to their audience. With under 8% of the articles using the singular and plural second person pronouns (“You”) and the plural first person pronoun (“We”), the websites are much more similar to blogs and personal pages than to scientific presentations on the Internet. The analysis showed that only 16% of the articles from the total sample made any reference to the issue of testing for hepatitis, while the number of articles that referred to certain drugs and pills for this disease was higher – 24% of the total sample. The number of articles that made references to Romanian legislation related to the National Programme for hepatitis was very small – only 6.8% – and the same situation appeared on the case of articles that covered those diseases that are frequently associated with hepatitis. The analysis showed the fact that the vast majority of articles considered was, in fact, only information about the disease and press materials targeted towards persons already infected with hepatitis. Information about the disease prevention and social aspects related to that illness were scarcely covered by the articles published by the websites. Taking into account this peculiarity of the websites presenting hepatitis in Romania I was interested to see what were the opinions of experts on the purposes of a health communication campaign meant to prevent and provide information on hepatitis. All respondents interviewed agreed that their involvement in an NGO’s activity related to the issue of health and illness changed their lives. Many of them were also founding members of the NGOs in which they were actively involved at the moment of the interviews. The idea of establishing a health-related association was a “natural” result of their illness, that being the moment when they understood that all patients needed support and information when they confronted the disease and felt alone and without any guidance in life. Claudia T: We made this group, supported by a website, in order to help people who find that they are infected with hepatitis. I already knew from my own experience how difficult could be when you found that you are infected with hepatitis, how difficult is to obtain information from doctors and how much is the need for information at the level of each individual facing that issue. Irimia C: We have founded those groups as a necessity to protect the patients’ rights and to represent a link between patients and stakeholders. Viorel C: My previous attitude was one of total indifference. After I found that I have hepatitis my attitude changed, it became a proactive one. As a result of getting infected with hepatitis, I searched to collaborate with doctors and I tried to inform other people about this disease. Irimia C: I think that people with high visibility could be involved in the making of those materials, and I refer here not only to specialists but also to stars, well-known intellectuals etc. The results of the online survey could validate only the first research hypothesis. If the people were somehow exposed to a public campaign related to hepatitis, then a high percentage of them (between 50% and 70%) declared that they wanted to know more about this disease. At the same time, according to their reports, only a small percent of respondents (between 2% and 6%) tended to change the health-related behaviour after exposure to a campaign related to hepatitis or a poster/image of such public health campaign. The current content analysis lead led to the validation of both research hypothesises about media content. Thus, on the one hand, the Romanian websites about hepatitis disseminate only information about the disease and not messages about preventing the disease. On the other hand, they disseminate information using medical terminology, which make them less accessible to the general public. In the same vein, both hypotheses related to experts’opinions from NGOs were validated. The Romanian experts considered that health-related campaigns are important for the prevention of this disease and they insisted that more information about the treatment and prevention of the disease should be available to the general public. The media is extremely powerful in promoting health beliefs and creating role models for contemporary people. As pointed out in a number of studies (Johnson, Hendrika, 1993; Nelkin, 1995), these health-related messages are effective devices of “social learning”, the people being able to learn what it means to be healthy with the help of the media (Johnson, Hendirka, 1993; Nelkin, 1995). Moreover, health public policies can be modified sometimes by the transmission of messages related to health (Cho, 2006). Incorrect or unrealistic information from medical reports may mislead the people that are working in public health policy and may contribute to the enactment of unfair laws and regulations (Hotz, 2002; Wells, Marshall, Crawley, Dickersin, 2001), the latter being regarded by scientists as real threats to public health (Voss, 2002). My analysis does not intend to offer solutions regarding the present situation of health communication campaigns in Romania. Instead, it shows that the success of such a campaign depends on a network of factors, among which the most relevant are the state’s financial investments in health domain and grass-roots activism of citizens in the field of health and illness. Adam, P. and Herzlich, C., 1994. Sociologie de la maladie et de la médecine, Nathan. Canguilhem, G., 1988. Ideology and Rationality in the History of the Life Sciences, MIT Press, Cambridge. Cho, S., 2006. Network news coverage of breast cancer, 1974-2003. Journalism and Mass Communication Quarterly, 83(1), pp.116-130. Curtis, S., 2004. Health and inequality: geographical perspectives. Sage Pbl. Ltd.
Hotz, R.L., 2002. The difficulty of finding impartial sources in science. Nieman Reports, 56(3), pp.6-7. Johnson, J. D. and Hendrika, M., 1993. A Comprehensive Model of Cancer‐Related Information Seeking Applied to Magazines. Human Communication Research, 19(3), pp.343-367. Jones, L., 2000. What is health? In: J. Katz, A. Peberdy, and J. Douglas, eds. Promoting Health: Knowledge and Practice. Basingstoke: Palgrave, pp.1–17. MacStravic, R. and Scott, E., 1986. Managing Health Care Marketing Communications, Aspen Systems Corporation; Rockville, Maryland. Nelkin, D., 1996. An uneasy relationship: The tensions between medicine and the media. Lancet, 347(9015), pp.1600-1603. Schiavo, R., 2007. Health Communication. From Theory to Practice, Jossey-Bass, San Francisco, CA. Voss, M., 2002. Checking the pulse: Midwestern reporters’ opinions on their ability to report health care news. American Journal of Public Health, 92(7), pp.1158-1160. Wells, J., Marshall, P., Crawley, B. and Dickersin, K. 2001. Newspaper reporting of screening mammography. Annals of Internal Medicine, 135(12), pp.1029–1037. ***World Health Organisation, 2015. Romania. Available at: <http://www.who.int/countries/rou/en>. [Accessed 6 August 2015]. ***<www.abch.ro>. [Accessed 4 August 2015]. ***<www.afladec.net>. [Accessed 5 August 2015]. ***<www.hep.ro>. [Accessed 6 August 2015]. ***<www.hepato.ro>. [Accessed 9 August 2015]. ***<www.test-hepatita.ro>. [Accessed 2 August 2015]. ***<www.tustiidec.wordpress.com>. [Accessed 6 August 2015]. ***Populaţia României ACUM. Available at: <www.camarasdelumini.wordpress.com>. [Accessed 6 June 2015].